ruskin - Crown Lynn Vase Number 30 ! Is this that Ruskin Ware? Here we go ladies and gentlemen, The one the only - Shape 30!!! I don't think a Photo has been recorded yet on the forum. 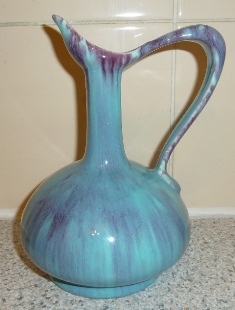 Some people say its a jug but its actually a handled vase. Just beautiful. Re: Crown Lynn Vase Number 30 ! Is this that Ruskin Ware? but if you like you can email a photo to the site at newzealandpottery@gmail.com and I will load it for you when I get a chance. They made several Jug/Vases so I will be keen to see which one you have. I don't know who made that beautiful jug/vase. Hope everyone had a great holiday. We traveled a bit and needless to say visited the usual types of haunt along the way. We barely even saw a Crown Lynn white vase for sale the whole journey! Even three or four years ago there was a lot more to look at. Must be all in collections now I dare say. Ev, as you know the vases in that auction are one of the CL perennial debates. Some affirm they are, some others point out the relative diversity of otherwise unknown shapes which are found in this colourway - which is also very unusual for Crown Lynn - mean that they are unlikely to be CL. The very good, even quality of the running glaze is also a point that suggests hesitation because, if they are CL, they would date to perhaps 1943-1945 - and as far as I know, the trickle/triple glazes didn't really approach reliable quality until just after the war. I heard that they employed Briar Gardiner as a glaze consultant about 1943, which if you have had a selection of Briar pieces, you will know is a bit like asking a largely self-educated lady hobbyist to suddenly transform herself into a professional industrial chemist. Actually, that is exactly what the situation must have been. She was set up for failure. No wonder they didn't start getting reliable glaze results until some trained industry expertise arrived from Britain right after the end of the war. There was a very recent Dunbar Sloane auction, which you referenced somewhere else, that had quite a number of these pieces. Simon Manchester was very cautious in his description of them and called them "possibly Australian." That, I think, is as good-a guess as any. Thanks for your input teaandcoffee and a Happy New Year to you too. It's been glorious for travelling with summer reigning supreme! I'm bidding on a Crown Lynn shape that has a glaze in tones that remind me of the Ruskin type ware and I'm keen to see if my thoughts are correct or not. There are a number of pieces by this manufacturer on Trademe at present. 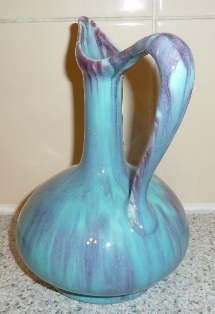 I stumbled across the following in an online antique shop - it is in America and they believe the vase was made in the U.S. 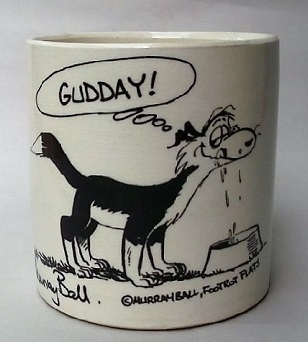 It has the same type of numbering and glaze as the ones purporting to be CL on Trademe. These are made using a white clay so wouldn't be from pre Crown Lynn days as they claim I don't think. This auction may have the answers to many questions about this ware! 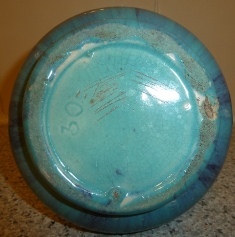 After extensive searching Pilkington's and Ruskin I cannot find a connection to this range that is sometimes called Crown Lynn in imitation of the Ruskin pottery. So the mystery remains for me at least. Pilkington's pottery has a large scrolled P on the base and I couldn't find numbers on any pieces made by either pottery.